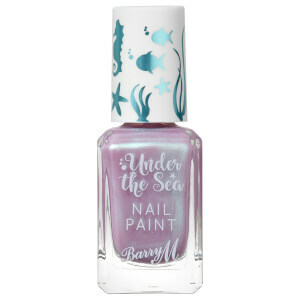 Unleash your inner mermaid with the Under the Sea Nail Paint from British cosmetics label, Barry M. Arriving in several colour-shifting duochrome hues with a shimmery, iridescent lustre, the alluring nail polish will have you glistening from every angle. 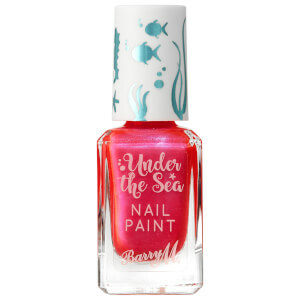 Presented in a glass bottle embellished with sea creates, the long-wearing and chip-resistant, the nail varnish glides on effortlessly and evenly for tips that mesmerise. Make sure nails are clean and dry. Use nail polish remover to wipe away any residue on the nail. 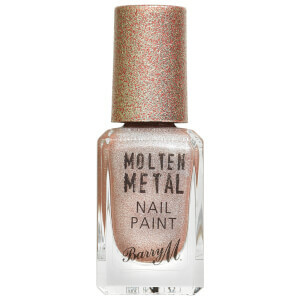 Apply two coats of nail polish and allow to dry for 5 minutes. Follow with one coat of top coat. Butyl Acetate, Ethyl Acetate, Nitrocellulose, Acetyl Tributyl Citrate, Adipic Acid/Neopentyl Glycol/Trimellitic Anhydride Copolymer, Isopropyl Alcohol, Stearalkonium Bentonite, Acrylates Copolymer, Silica, Magnesium Silicate, N-Butyl Alcohol, Benzophenone-1, Diacetone Alcohol, Trimethylpentanediyl Dibenzoate, Synthetic Fluorphlogopite, [+/- CI 77891, CI 77491, CI 15850, CI 19140, Tin Oxide].